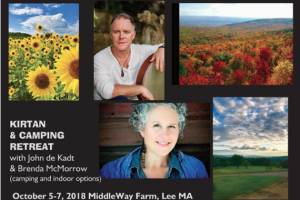 This intimate and beautiful weekend will be held at Middle Way Farm (345 Lander Rd., Lee, MA, 01238) which features gorgeous panoramic mountain views, hiking trails, a pond and a giant stone circle. Come “tune out and tune in” in this back to nature setting while we slow down and join in these timeless practices that open our hearts. This newly renovated, small and beautiful cabin sits beside a stream with it’s own private deck surrounded by forest. This cabin is steeped in nature and has a very comfortable queen sized bed, a woodstove, candles and private outhouse. Perfect cozy retreat get away whether alone or in a couple. Those staying in the cabin will shower in the main house.